On 7 July 1948 Mr and Mrs Austin-Smith invited the Convent community of about 50 sisters, novices and postulants to a picnic on their farm Stockdale. Seeing their simple joy and happiness had reminded him of his own boyhood, when poor and friendless, they had immigrated to South Africa. The Holy Cross Sisters in Cambridge had educated their 2 children, who had died in 1939 and 1948. They approached the Provincial Superior, Sr Gertrudis Weissenberger that they had decided to give the Farm to the Sisters, hoping it would be a place to which sick and aged Sisters could retire. In 1952 a small Farm School was opened and in the same year a prefab Mission Church was erected. The number of pupils varied between 99 in 1982 and 30 +/- the last few years; the school catered for 6 Standards (Grades). In 2002 Mount Carmel Primary School was joined to Holy Cross Primary School, Aliwal North as a Satellite School. At the end of 2005 the School was closed. 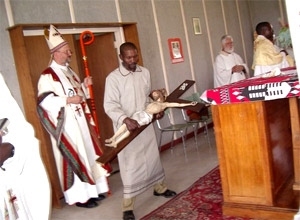 End of 2010 Mount Carmel Farm was handed over to the Aliwal Diocese. As part of that process the prefab church was closed on 27th April 2010 to become the Hall for the work with the youth of the Diocese. Bishop Michael Wüstenberg with 8 priests celebrated a solemn Thanksgiving Mass. Sisters of Holy Cross and Sacred Heart, the Senate of the Diocese, Farm workers with their families, guests from the neighbouring farms and the choir of St. Francis Mission of Dukathole filled the Church. The Bishop thanked all Holy Cross Sisters who had contributed to the development of the Church on Mount Carmel Farm.